In case of production of die casts utilizable especially in expansively growing automotive industry, the particular attention is devoted to a goal-oriented increase of commercial and utility properties of a product in with acceptable economical costs. 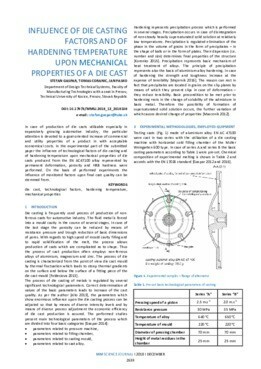 In the experimental part of the submitted paper the influence of technological factors of die casting and of hardening temperature upon mechanical properties of die casts produced from the EN AC47100 alloy represented by permanent deformation, porosity and HRB hardness were performed. On the basis of performed experiments the influence of monitored factors upon final cast quality can be stemmed from.